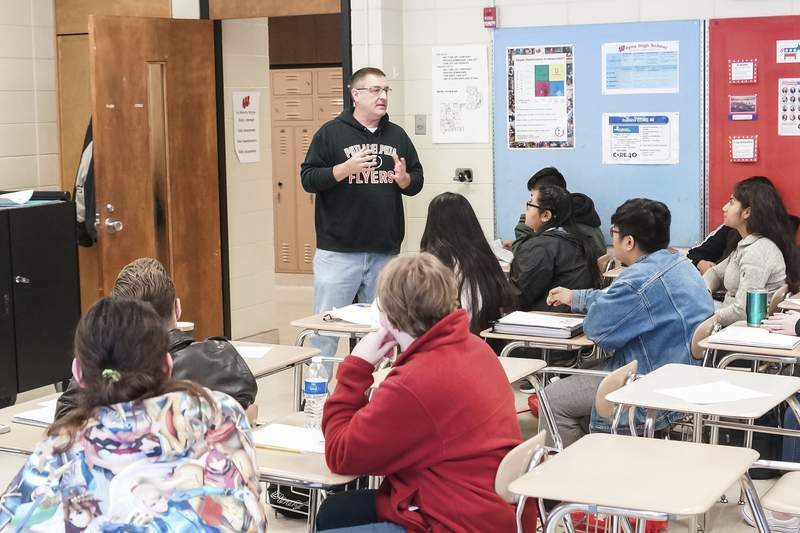 Mike Moore | The Journal Gazette Tim Gaskill, an Advance Placement government teacher at Wayne High School, discusses the U.S. Constitution with his students Friday. Students enrolled in AP classes can earn college credit for completing them. • 62 percent of Indiana high school students earn college credit through dual-credit or Advanced Placement courses. • 70 percent of all dual-credit earners – and 93 percent of students earning both dual and AP credits – enroll directly in college after high school compared to 44 percent of students with no pre-college credit. • 10 percent of dual-credit earners require remediation in college compared with 27 percent of students with no pre-college credit. • Statewide, dual-credit saves students an estimated $69 million in tuition costs, or about $1,600 per student. By taking advantage of dual-credit and Advanced Placement classes offered at Homestead High School, senior Diya John has steadily earned college credit since her freshman year. Depending on her AP test scores this spring, she could leave the Southwest Allen County school with nearly 60 college credits. John's not alone in using high school to get a jump-tart on college. The Indiana Commission for Higher Education last week announced that option is gaining popularity statewide. About 62 percent of Indiana high school students – or nearly 45,000 – earned college credit through dual-credit and AP courses in 2016 compared with 47 percent in 2012, the agency reported. “Our most recent data indicate that high school students are not only earning more early college credit than ever, but the credit they earn in high school is actually leading to higher success rates and cost savings for students and the state,” Indiana Commissioner for Higher Education Teresa Lubbers said in a statement. Dual-credit courses are classes that let students earn high school and college credits simultaneously. They can be taught at high schools or colleges. AP classes are a College Board program. Students scoring three or higher on AP exams may receive credit or skip the equivalent college course at many institutions. State law requires high schools offer at least two dual-credit courses and two AP classes. Thousands of Allen County students are taking advantage of the opportunity. More than 1,500 students have taken dual-credit courses annually at Fort Wayne Community Schools since at least 2016-17, when 1,717 students took such a course. This year, the district has 1,676 dual-credit students, according to spokeswoman Krista Stockman. The number of students in AP classes has increased from 695 in 2016-17 to 916 students this year. Carroll High School's participation in dual-credit courses nearly doubled between 2016-17 and 2017-18, from 426 students earning 731 credits to 811 students earning 967 credits. AP classes experienced smaller gains: 440 students taking 696 courses in 2016-17 compared with 479 students taking 798 courses the following year. At Homestead High School, participation in dual-credit courses has increased significantly since 2012. At that time, fewer than 300 students accounted for about 400 enrollments; in the 2017-18 year, more than 2,000 students accounted for more than 4,000 enrollments, according to information provided by Assistant Principal Susan Summers. AP enrollments are usually around 1,000. Homestead students also have more dual-credit options than in 2012, when eight courses were offered. In 2017-18, more than 50 were available, Summers said. The school has nearly 20 Advanced Placement courses. Overall, Summers said, many Homestead students graduate with one to four semesters of college credit, but private and out-of-state colleges don't always accept the hours. Homestead has had great results, Summers said. One student was accepted at a private in-state college and took 38 credits with her, she said, and another took 53 credits. Participation in classes generating college credit varies among East Allen County Schools' five high schools, with East Allen University leading the way, according to information provided by spokeswoman Tamyra Kelly. At EAU, every student is taking dual-credit courses. Meanwhile, 136 students at New Haven High School last year earned about 1,230 college credits, and the popularity of AP and dual-credit courses has increased at Leo Junior-Senior High School in recent years. There, about 54 percent of 2018 graduates received college credit compared with about 42 percent in 2016. Leo officials expect the trend will continue. Entering college with a “significant amount of dual credit” could make it easier for students to pursue double majors or minors, said Carl Drummond, vice chancellor for academic affairs and enrollment management at Purdue University Fort Wayne. “There's value to the student if they use that opportunity to get a richer college experience,” Drummond said. Along with seeing higher percentages of students entering college with college credit, he said, Purdue Fort Wayne has noticed an increase in the number of credit hours students bring. Now, it's common for students to start their freshman year with close to a semester's worth of credit. Several years ago, three hours of credit – or one class – was typical, he said. The type of student earning pre-college credit has expanded to include good students – not just the strongest academically, Drummond said. “That's where the growth has been,” he said. At Purdue Fort Wayne, most dual-credit students take those classes at their high schools, Drummond said. Depending on the class, students receive a 60 to 90 percent discount from the on-campus tuition rate. Rates vary by college, he said, noting fees may be waived for students qualifying for free or reduced-priced lunch. Homestead estimates earning college credit in high school annually saves its graduates more than $3 million in tuition based on current enrollments and an average tuition fee of $225 per credit hour if the course was taken at a public university. Data show students with dual credits are more likely to graduate from college early or on time, the agency found. Chances of collegiate success are even greater for students who earned credits from both AP and dual-credit classes. Drummond noted growth in dual-credit programs might be stymied by a shortage of dual-credit teachers, who must have a master's degree in the discipline or 18 hours of graduate credit in the discipline. Fort Wayne Community Schools is offering incentives to teachers pursuing dual-credit credentials. Under renegotiated contract terms approved in November, teachers may receive a one-time stipend of $3,500 for completing the coursework necessary to teach a dual-credit course. Although dual-credit courses can help students reduce college costs and delve into classes related to their major sooner, Drummond said the high school setting doesn't provide the same learning environment as colleges. On campus, he said, themes and concepts would likely be covered in a more mature way, with students of varying ages and life experiences contributing to the discussion. Southwest Allen officials, meanwhile, noted dual-credit classes let students earn college credit with the support system of a high school and in classrooms more intimate than a university lecture hall. John, who hopes to pursue engineering, recommends high school students take dual-credit classes. “It will definitely help you in the long run,” she said.